The NCBLA’s 2014 conference In Search of Wonder: Common Core & More shared information demonstrating how young people’s literature, both fiction and nonfiction, can be used in the classroom to augment textbooks, enriching and expanding young people’s knowledge base. Educators, librarians, and parents, you will find the educational support materials we developed for the conference —booklists, author interviews, resource guides, lesson plans, and more—pertinent and helpful to your educational goals and needs, even if you did not attend the conference. Of special note: be sure to check out the list of Common Core book recommendations categorized by academic disciplines. We hope these materials will inspire you to introduce more quality literature in the classroom and the library across all academic disciplines! Click on a category or scroll down to discover all our In Search of Wonder resources. The entry for each book in the book lists includes a recommended age range and summary to help you decide which books will meet your needs, plus other basic information you need to find the book at your library or bookstore. Just like our education resource guides, each list has been published as an easy-to-print file. Just click the list title to download and print it. For each of the five participating authors, we have developed an education resource guide that provides engaging activities and discussion questions all linked to particular Common Core standards and designed to demonstrate how you can use each author’s books in your classroom or library. We have published all of these guides in an easy-to-print format so you can print and store these materials in binders for quick access. Each of the authors who participated in the In Search of Wonder event was interviewed and video recorded by students. 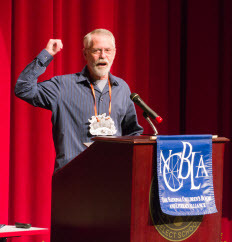 The NCBLA thanks the talented students of Perry Local Schools for all their work in planning and producing these author interviews, which discuss such diverse topics as inspiration, the power of poetry, and censorship. The following lists brief information about each of the participating authors, plus it includes an extensive list of each author’s publications organized by Common Core connections. Chris Crutcher writes fiction honestly about real issues facing teenagers today: making it through school, competing in sports, handling rejection and failure, and dealing with parents. Learn more about Crutcher and his books on his website ChrisCrutcher.com. Nikki Grimes writes fiction and nonfiction books—including poetry, prose, and picture books—for young people in elementary and middle school. Learn more about Grimes and her books on her website NikkiGrimes.com. Steven Kellogg writes and illustrates fiction and nonfiction picture books for pre-Kindergarten and elementary school children. Learn more about Kellogg and his books on his website StevenKellogg.com. Katherine Paterson writes poetry, prose, and fiction—including picture books, chapter books, and novels—for young people in elementary and middle school. Learn more about Paterson and her books on her website KatherinePaterson.com and her Facebook page. Tanya Lee Stone writes fiction and nonfiction for young people in elementary, middle, and high school. Learn more about Stone and her books on her website TanyaStone.com. Wild America Series: Beaver; Crow; Rabbit; Mouse; Deer; Raccoon; Earthworm; Turtle; Opossum; Skunk; Squirrel; and Toad.